One of the most interesting ornaments seen on Anatolian rugs is the so-called 'Keyhole' or 'Re-entrant' device. This motif is formed by a continuous narrow band that runs largely around the edge of the field: at the sides it is close to and parallel with the borders; at the lower end, it runs parallel to the main border until, towards the middle, it 're-enters' the central part of the field, often in an inverted 'U' shape, resembling a keyhole. Rugs with this device are also known as 'Bellini' rugs, because of depictions in two paintings, Gentile Bellini's Madonna and Child Enthroned, after 1469, in the National Gallery, London, and Giovanni Bellini's The Doge Loredan and Four Advisors, 1507, in the Bode Museum, Berlin. 33 Keyhole rugs have been recorded in European paintings from the end of the 15th to the beginning of the 17th century. This suggests that, despite the preservation of comparatively few of them (18 are known similar to this Berlin example), these rugs were greatly admired and were imported into western Europe in substantial numbers. 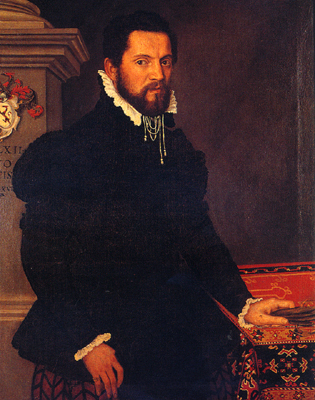 Perhaps the closest example to the Berlin Keyhole rug is depicted in a Portrait of a Gentleman by an unknown Venetian artist, 1562, in the Museo Civico, Padua. 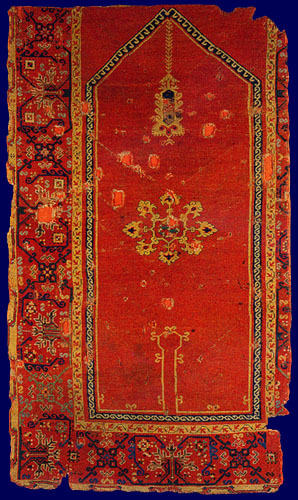 Another rug similar to this is in the Metropolitan Museum of Art, New York, from the Ballard Collection in St. Louis. The surviving rugs of this design represent a tradition stretching back over many centuries, and should be judged as being among the greatest manifestations of Anatolian tribal art. The particular medallion and hanging lamp seen here are features associated with other carpets attributed to the end of the 15th century.